The event is hosted by the Vietnam Software and IT Services Association (VINASA) and the Vietnam-Japan IT Cooperation Club as part of activities to celebrate the 45th anniversary of the two countries’ diplomatic ties. During his welcome speech, Deputy Minister of Information and Communications Nguyen Minh Hong said that Vietnam-Japan cooperation in IT has been strengthened by state agencies and businesses, who act as a bridge between the IT associations of the two countries. Vietnam’s Ministry of Information and Communications and the Japanese Ministry of Internal Affairs and Communications have signed a number of agreements for comprehensive collaboration in radio frequency control, information security, ICT workforce training, and more, he noted. The two sides have accelerated the implementation of an action plan for the development of digital industries within the framework of bilateral partnership towards 2020, with a vision to 2030. According to the Japanese Ministry of Internal Affairs and Communications, Japan is currently facing a shortage of about 171,000 engineers, and is likely to lack a total 369,000 engineers – including 48,000 in the technology sector – by 2020. The increasing demand for IT workers will open a huge opportunity for Vietnamese and Japanese enterprises to collaborate in times ahead, especially given that Vietnam has a large pool of ICT workers. Vietnam has around 290 colleges and universities offering IT courses with approximately 55,000 graduates each year. The top trends of Industry 4.0 – such as the Internet of Things, artificial intelligence (AI), and big data – together with Vietnam’s substantial IT workforce will pave the way for expanded IT cooperation between the two countries, said Nguyen Doan Hung, Vice Chairman of VINASA. 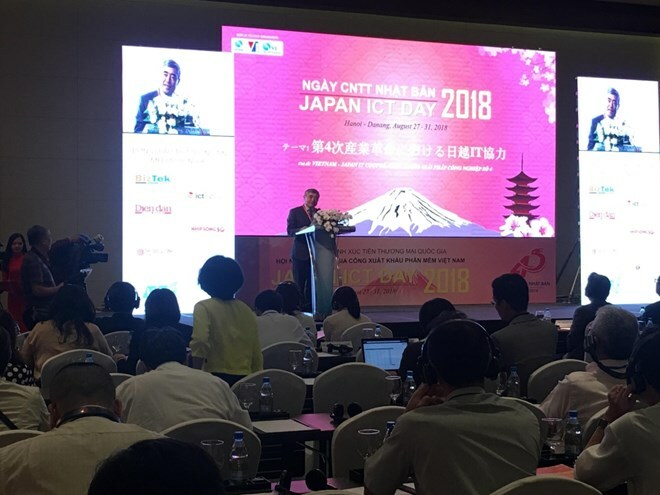 Held in Hanoi and Da Nang from August 27-31, the Japan ICT Day 2018 event has attracted 350 domestic and foreign delegates, including eight delegates from Japan. It features workshops, talk shows, and business-matching events to promote links between Vietnamese and Japanese IT firms, as well as the Hackathon Vietnam 2018 competition under the theme “Smart City”. During the event, updated reports on the development of IT cooperation between Vietnam and Japan will be released. Participants will be also provided with an overview of Japan’s IT industry. Leading IT firms of both sides will share information related to smart city projects in Hanoi and discuss the reality of Vietnam-Japan IT cooperation in new technology projects, including measures to improve the quality of future collaboration.